Before talking about the camera specifically even a few hours with it has brought home to me the truth of the quote I posted from Luminous Landscape. "At Photokina in 2006 I had dinner with a senior executive in the photographic industry. We were talking about the historical market battle between Nikon and Canon. At one point he paused and said, "You know – the future doesn't belong to either of those two. The future of the photographic industry belongs to Sony and Panasonic. They get it. As for as I can tell, neither Canon nor Nikon do. They're simply putting higher resolution and cleaner sensors in the same old boring cameras. That's not just what the future of this industry is about. Wait – you'll see". After using the Sony A55 and now the Panasonic GH2 I totally agree with this. Both cameras are bristling with quality and innovation, in small, light and relatively inexpensive packages. I'm not talking about gimmicks introduced to grab a few headlines, but genuine, useful, well thought out and implemented photographic innovation that assists us as photographers to both take better pictures and extend the scope of what its possible for us to do. I gave the example of IBM in a previous post, who made the catastrophic commercial judgement that personal desktop computers were not going to be of any significance in the global IT market. It seems to me that Canon and Nikon have made the decision that the mirrorless (and now fixed mirror) wonders coming out from Panasonic, Sony & Samsung in particular, are not particularly significant in the global camera market. They have often spoken with patronising indifference about the users of such cameras, assuming that "real" photographers, i.e. professionals, enthusiasts, serious amateurs or whatever they are called, will stick with the DSLR. I believe they are wrong. This revolution won't happen in 2011, nor probably for a few years yet, but I see it coming. The size, weight, features, performance and price advantages of these "non-dslrs" are becoming so appealing to photographers, that its difficult to see the continuing lure of the ubiquitous black DSLR anymore. Thom Hogan is right on the money when he writes:- "At the moment, neither Nikon nor Canon have chosen to play in the mirrorless arena. Nikon is likely to be the next entrant, and I expect to see their model hit the shelves by about March 2011. Ditto Pentax. No word on Canon. Frankly, I think waiting for a maker to enter this market is probably a waste of time. Why? One word: lenses. The smaller distance from lens mount to image sensor on the mirrorless cameras--remember that big mirror was removed--means you need new lenses to compete in this arena. Yes, you can get mount adapters to use older lenses on these cameras, but that typically means that the whole combination of camera body and lens gets much, much bigger, and things like autofocus disappear or get a performance hit. So not only are you waiting for Nikon, Pentax, and Canon to make a mirrorless camera, you're waiting for them to make the lenses you'll want, too. Given Nikon's six to eight lens a year pace, you could be waiting awhile." 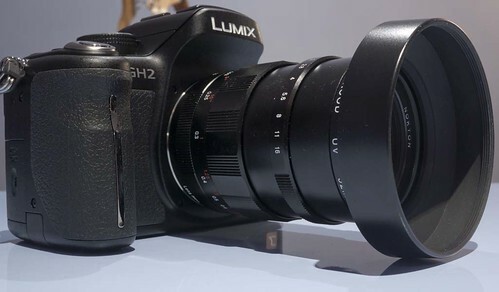 The GH2 has been released and is able immediately to take advantage of the largest lens range of any camera system. There are Panasonic, Olympus and now Voigtlander native m4/3 lenses available, there is the whole 4/3 lens range and via adapters literally thousands of other lenses both current and vintage to take advantage of. 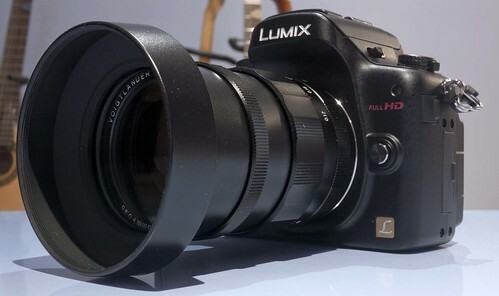 A word of warning, if you are a bit indifferent to m4/3 in general and the Panasonic GH2 in particular you might want to give this blog a miss for a few days. This is probably the camera that I have waited for more impatiently than any other, with a good deal of anticipation. I will therefore be concentrating on it for quite a few posts. My GH2 arrived from Mathers of Lancashire late yesterday afternoon. I don't often give retailers a plug, but Mathers are a company who I have dealt with for years and they are always very helpful, and VERY competitive on price. I paid £729 for my GH2 + 14-42mm lens, which for the UK and a newly released camera I'm very happy with. The camera arriving so late didn't give me the opportunity to use it outdoors, which I'm saving for today. Well the design is quickly taken care of, its just like the GH1! Well close enough not to make any difference. The body has however changed. Its now plastic, in place of the "skin" type finish of the G1, GH1 etc. Initially I thought it looked and felt cheap, but having examined it thoroughly I realise that its very well put together. There were problems with the previous finish I know and certainly the addition of a rougher material to the handgrip has improved handling. I was pining for a silver one, but now I'm not so sure. I was imaging something like an E-P2 I think but the GH2 doesn't have that "metallic" look and finish so I'm not sure it would work that well. Some changes here. I'll comment more on this as I use the camera, to see if I think that these are improvements or not, but initial use wasn't too difficult and I haven't found myself screaming abuse at the Panasonic design department. Yet! Not being able to use the camera in daylight I was able to see how it performs in low light. The answer is thats its substantially better than the GH1. ISO 3200 is now usable with no banding. ISO 6400 and ISO 12800 need a lot of noise reduction to make them acceptable, but it is possible. The GH2 has moved up a notch in this regard. The argument for a DSLR being better at High ISO's is slowly being eroded away. This is not a D3S or 5DMkII, but its pretty close, if not better because the pictures are sharper, than cameras like the 7D or 550D. Pretty fast. No problems here. Will comment more on this when I get into a situation where I use it for real. I was only able to take some pictures at the base ISO 160 using a tripod. I did this with my 20mm f1.7 and 14-150mm Leica Panasonic zoom. I must admit I was blown away by the quality. Wonderful sharpness, colour and clarity. I really need to do an outdoors test on this, but I'm getting quite excited about the possibilities of this sensor. Sometimes taking close-up shots indoors with a tripod doesn't always match up with results hand held outdoors, so I'll have to be circumspect on this. I was pretty impressed though. When I get anything decent I'll post some full-size samples. I shot a brief bit of video, which looked terrific. Very very good in low light at 1600 & 3200. The 1 to1 crop ratio is simply amazing & gives you long lenses for video. See here for what this is all about. Finally the touchscreen. I was expecting to hate this, but the ability to use it to focus and even take a picture by just touching the screen is very useful. I can see it working really well in situations where you need to work fast. So just a brief taste. So much to try, so little time! There will be more on the GH2 in the coming days.